Tailor-made for every application; all components feature the benefits of a series well thought-out right down to the finest detail. The timing relays DIL ET have been matched to the construction design of the contactors DIL E; the ETR 4 variant has been optimised for the measurement and monitoring relay as well as the safety relay; the timing relays ETR 2 are optimised for use in service distribution boards (space unit 17.5 mm). Thus, the space in the control panel can be optimally used and the system is provided with a common design appearance. All devices are devices for world markets to IEC/EN 60947 with UL/CSA approval. Many relays feature multi-voltage coils. This simplifies stock keeping and enhances the flexibility when reacting to customer requirements. 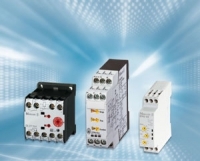 Depending on the application, it is possible to choose between single-function and multifunction relays. The timing relays feature 12 different functions.